Is the data Facebook collects secure? You might not think so after 87 MILLION Facebook users had their data leaked to Cambridge Analytica that was later used for highly-targeted Facebook ads during political campaigns. But what really happened? Is your data safe? 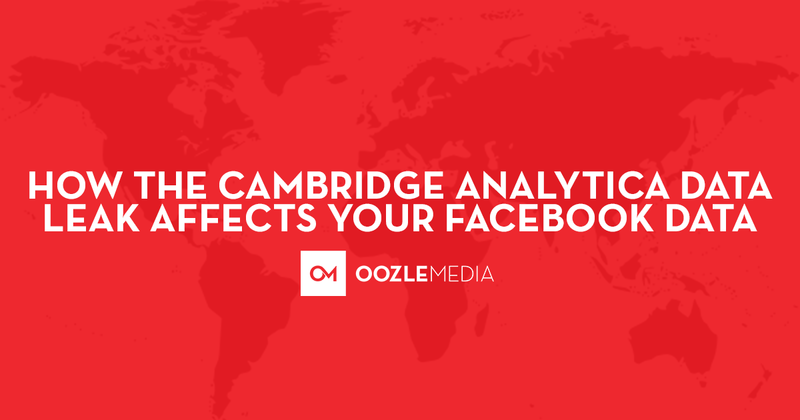 Here’s the inside scoop of the Cambridge Analytica “scandal” and how the changes Facebook is making could affect you or your business. This data leak all started with Dr. Aleksandr Kogan, who created an app in 2014 called “thisisyourdigitallife”. When Kogan first published this app, it legally collected data from its 270,000 users, including geographic information, things the app’s users liked and interacted with on Facebook, and even information about each user’s friends. At the time this data collection was not illegal. Whether or not people knew that apps were allowed to gather not only their data but data from their friends, apps like Kogan’s were still collecting data legally under Facebook’s policies. When Facebook realized what was happening, they revised their policies to prevent apps like Kogan’s from collecting so much data, especially without permission from friends of app users. The problem: Kogan, against Facebook’s policies, shared 87 million users’ data (including not only the app users but the friends of the app users) with Cambridge Analytica. Facebook took action all the way back in 2015, requiring Cambridge Analytica to destroy the illegally-obtained data. They certified the data was destroyed, but it wasn’t. This data was then used as part of highly-targeted political ad campaigns during the Trump administration. Rather than trying to get more votes for Trump, they targeted non-supporters to not vote at all. Now that this data leak has been made public, the government is taking action against Zuckerberg and Facebook. Zuckerberg will have to testify in front of the U.S. Congress, and the British Parliament is also considering taking action. With all this backlash Facebook is taking, Facebook is cracking down on a few things for both users and businesses. What Is Facebook Changing to Protect Users? Facebook is revisiting and changing their data privacy policies. On April 9th, all Facebook users affected by this change will have a link at the top of their newsfeed that shows which third-party apps are gathering your information. Facebook has also added a new privacy shortcuts menu to make it easier to manage the data collected about you. What Is Facebook Changing for Businesses and Social Ads? Audience estimates have been removed, possibly for good. When targeting a specific audience with an ad, originally you could see a general estimate of how many people your ad could potentially reach. Without this estimate, selecting your ad budget is going to be much harder. High-level targeting will be very weak if many users choose to delete their data. Certain audiences will be harder to target if enough people delete their data. Basically, if you’re trying to target a specific group of people but there’s no one who matches your target audience, your ad won’t get in front of who you’re trying to target. For example, lookalike audiences focus on people who are similar to your current customers. If there’s no data about that type of audience, your ad won’t get in front of the right people. New apps and bots have been put on hold until a new approval process has been created. To make sure a data leak like this doesn’t happen again, Facebook is revisiting their apps and bots approval processes again. These new policies will force businesses to comply with rigorous policies and terms, to be later determined by Facebook. Existing apps will have many capabilities pulled. Apps that were originally given access to collect certain types of data from users may have some of their collecting capabilities pulled until Facebook finishes their new approval process. Even apps that have already been approved will be affected. With This Data Leak, Are Facebook Ads Likely to Disappear? The short answer? No. Facebook is only free because of the ads companies pay to have appear on users’ feeds. However, with Facebook making it easier for users to delete their data, it will be harder to target the right audience all the time. Without the data Facebook collects, Facebook is unable to put relevant ads in front of the right people. Pay attention to which third-party apps are collecting your data. Some apps are useful, while others don’t need your info. It’s up to you to decide which apps should be allowed to track your data. Understand what happens when you delete your data. Deleting your data doesn’t change things like you’d hope. In fact, Facebook mostly uses your data to put ads that are relevant to you on your feed. If you delete your data, Facebook won’t be able to put ads on your feed that are relevant to you. Why are relevant ads so important? Think of it this way: You’re watching TV and a commercial comes on screaming at you to “buy the best truck of the year,” but you’re not interested in buying a truck. It’s just annoying noise. Compare that experience to a relevant ad. What if you saw an ad about a new restaurant that serves some of your favorite foods? Maybe you act on that ad and it becomes your new favorite place to eat! Relevant ads can make the Facebook experience better. Platforms and services, including Google, LinkedIn, and Twitter, all collect your data in some way. While Facebook is empowering users to take control of that data, it doesn’t mean that data collection is bad. The data Facebook collects allows Facebook to provide ads that are relevant to you. It’s also important to note that deleting your data doesn’t mean it stays gone. The second you start using Facebook again, Facebook starts collecting your data all over again. If you have any questions about what this data leakage means for you or your business’s Facebook account, don’t hesitate to give us a call!